According to various scientific estimates, water vapour is the most important gas absorbing heat on Earth. Together with the clouds, it is responsible for 66% to 85% of the greenhouse effect. CO2 causes "only" 9-26% of the effect. However, the current concentration of CO2 in the Earth's atmosphere is the highest in 650,000 years. This is the period for which reliable data from ice cores were obtained. Based on other geological evidence, scientists assume that the CO2 content has not been as high as now for 20 million years! Are we in danger of a cataclysm? Yes, with accelerating global warming. It already happened on Earth in the past but it was due to natural causes, not human, emitting into the atmosphere more and more CO2. For many species of plants and animals, global warming has fatal consequences. People do not want to be extinct, like the dinosaurs, and that is why scientists are looking for ways to limit CO2 content in the air, including researchers from the University of Warmia and Mazury (UWM). 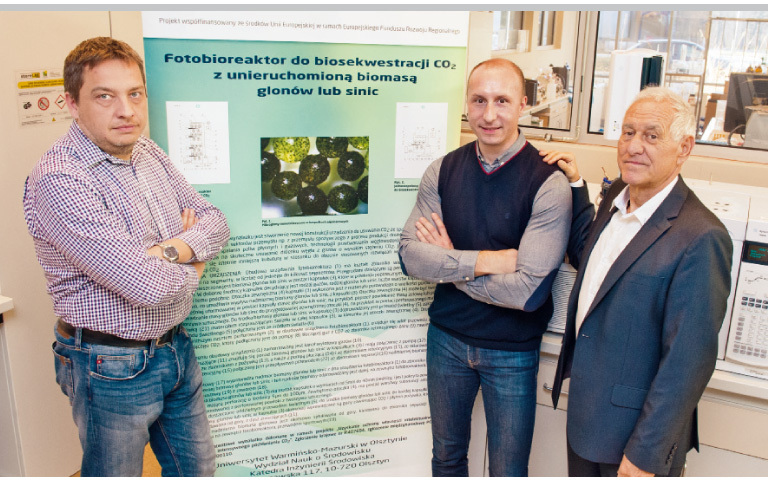 Three employees of the Department of Environmental Engineering at the Faculty of Environmental Sciences - prof. Mirosław Krzemieniewski (on the right), prof. Marcin Zieliński (on the left) and prof. Marcin Dębowski (in the middle) recently patented a device for intensive CO2 absorption with the Polish and European Patent Offices. Currently, the most common method of reducing CO2 emissions to the atmosphere is to store CO2 underground in empty chambers formed after pumping natural gas out of them. It is an expensive and haphazard method. Nobody can guarantee that one day, due to tectonic movements, there will be no gap in the Earth's crust through which CO2 can escape to the surface. Because this gas is 1.5 times heavier than air, it will collect around the leak and all animals and humans will be poisoned or die. There are companies that offer dumping CO2 in containers at the bottom of the oceans, but this is also uncertain. In the 1970s, American researchers tried to use algae to capture CO2. The method proved to be effective, but the algae required large areas – so much area that even in the US, where there is no lack of space, the project was abandoned. However, the scientists from Kortowo have followed the American effort. - We have developed a way to concentrate algae. Algae capturing CO2 in America formed a suspension in rectors. We prepared a concentrate and developed a technology for enclosing CO2 in capsules made of a kind of organic gel. Owing to this, the installations employing this technology do not have to be large at all - explains prof. Mirosław Krzemieniewski, head of the research team. Algae do not need much to live: heat, light, CO2 and nutrients. How to feed the algae has been known for a long time. CO2 and heat will be provided by the installation, but what about the light? Well, they found a way, using optical fibre. What do algae grown in this way produce as a result of metabolism? Pure oxygen. In addition, an excess of algae, which will grow extensively in an aerobic farm, can be used as a valuable raw material for the production of organic fertilizer, feed or oil. The precursory laboratory installation worked. Polish and European patent offices have granted the patents. What is next? - In cooperation with our Centre for Innovation and Technology Transfer, we filed patent applications in China and Russia as well as in several European countries. Our goal is to commercialize the patent. It has a good chance of implementation, but a pilot installation is needed for this. Our university does not have the funds for it. We hope that we will be able to interest the market (coal-fired power plants and heating plants) that our way of producing oxygen will become as common as sewage treatment plants - adds prof. Marcin Zieliński.